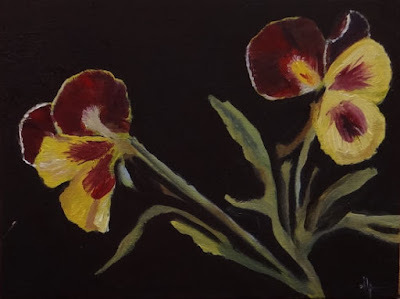 diana lynn's painting a day: Pansie pants. I have been trying to grow pansies for my sister Roni and have been failing at getting the to grow, so, I decided to paint some for good luck. This was from a photo reference book I have on flowers. I was hoping to get more of the fragile nature of the flower but I think they look tought as nails. Still the dark background makes them pop.